NAISDA Dance College has been recognised as Educational Institute of the Year at the 2018 National Dreamtime Awards, which were held at The Star, Sydney on Friday 16 November. The National Dreamtime Awards are an opportunity for First Nations people from across Australia to come together and recognise excellence within the categories of Sport, Arts, Education and Community. The peer-nominated Educational Institute of the Year Award is awarded to an institution that has demonstrated a commitment to improving access and opportunities for Aboriginal and Torres Strait Islander students. NAISDA Chief Executive Officer, Kim Walker, said that the organisation is thrilled to receive this significant accolade. “This recognition reflects NAISDA’s rigour, governance and commitment to forward planning. It is a consolidation of the organisation’s strong work over the last 10 years on Darkinjung land as an agile Indigenous Social Enterprise,” said Mr Walker. “We would like to thank our visionary Founder, Carole Y. Johnson, along with the tireless commitment of NAISDA Boards and Chairs, NAISDA’s team of dedicated staff and trainers and of course, our Elders and Cultural Tutors. “We would also like to acknowledge and recognise the many relationships we’ve formed with communities and organisations over the years, including our funders, sponsors and partner organisations,” he said. For over four decades, NAISDA Dance College has been fostering the next generation of Aboriginal and Torres Strait Islander creative and cultural leaders. This accolade recognises NAISDA’s commitment to excellence across all levels of the organisation. “This honour galvanises our growth and momentum to navigate towards an exciting new future,” continued Mr Walker. “We are committed to building a new centre of Indigenous Creative Study, Naya Wa Yugali, which will deliver a new model for Indigenous Creative Learning in Australia. 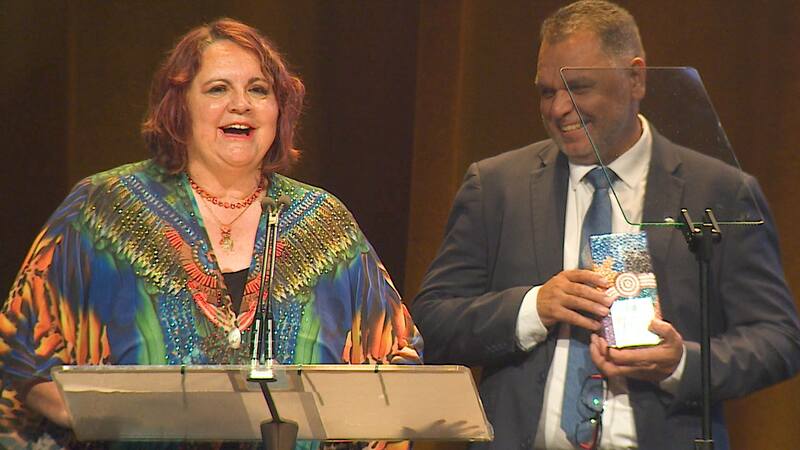 “This Award is a significant symbol of our community’s support and work towards this plan and acknowledges the impact the organisation is making within the Indigenous education, creative, cultural and business landscapes,” he added. The Award was accepted on behalf of NAISDA Dance College by NAISDA Chair Sean Gordon and NAISDA Board of Studies Chair, Dr Nerida Blair. “Finally, I would like to congratulate our fellow nominees and the many other educational institutes working hard to foster and strengthen learning and development opportunities for our Aboriginal and Torres Strait communities. “We are honoured to be amongst such finalists and pay tribute to the remarkable contribution and impact that they make to our communities every day,” concluded Mr Walker.